GRAND CHUTE, WI - The final part of the Wisconsin Timber Rattlers promotional calendar is ready to be unveiled. The team is bringing back some of the theme nights and special days from past seasons and adding some new ones for 2019. SUNDAY, APRIL 7 - ALL-FAN FIRST PITCH: Everyone can get in on celebrating the Timber Rattlers 25th Anniversary Season by participating in the All-Fan First Pitch. Toss out a ceremonial first pitch before this game just by purchasing a ticket to this game. FRIDAY, APRIL 12 - MILLER PARK GAME: Follow the Timber Rattlers to Milwaukee as they take on the Quad Cities River Bandits at Miller Park for this game. Tickets available through the Milwaukee Brewers, but we are offering a bus trip for those who are interested. Contact the Timber Rattlers at (920) 733-4152 for more information. SUNDAY, APRIL 14 - FOX VALLEY ANIMAL REFERRAL BARK IN THE PARK #1: The first of five Bark in the Park games during the 2019 season will take place on this date. Bring your favorite canine to the park to sit on the left field berm for the game. Admission for your pup is free and there will be plenty of fun for everyone! TUESDAY, APRIL 23 - D.A.R.E DAY: There is a pregame presentation by local D.A.R.E Officers to cover safety practices for elementary and middle school students planned before this afternoon contest. Any school group attending this game will receive a discounted ticket rate. Contact Group Sales Representative Kyle Fargen at kfargen@timberrattlers.com for more information or to order tickets for your group. THURSDAY, APRIL 25 - PARTY LIKE IT'S 1995 - The Rattlers are marking their silver anniversary this season and you can help them by celebrating 25 seasons. Tickets start at just $3 for this game and there will be throwback pricing to 1995 on concession items, too! THURSDAY, APRIL 25 - SPORTS CAREER FAIR - If you are looking for a way to learn about starting a career in sports, this is the night for you. There will be a career fair involving front office personnel from the Green Bay Packers, Milwaukee Brewers, Milwaukee Bucks, and other sports teams from around Wisconsin, a panel discussion, and question and answer session in the Fox Communities Credit Union Fox Club before the game. Contact Group Sales Representative Kyle Fargen at kfargen@timberrattlers.com for information or to order tickets. 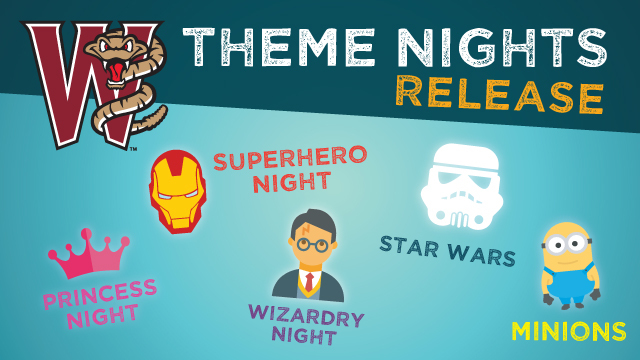 FRIDAY, APRIL 26 - MINIFIGURE NIGHT: The Timber Rattlers are celebrating everyone's favorite building blocks with a mini-figure of Fang T. Rattler for the first 1,000 fans to attend this game courtesy of Children's Hospital of Wisconsin. There will be life-sized figures for you to meet on this night and a LEGO Miller Park on display, too! SATURDAY, APRIL 27 - YOOPER DAY PRESENTED BY KEWEENAW PUB AND NORTHWINDS ADVENTURES: Last season's day was a lot of fun so we are so happy to bring back a day to celebrate the people of the Upper Peninsula. There will be pastys available, U.P. businesses will be on hand, and the first 1,000 fans to attend the game will receive a Yooper-themed giveaway. There are a limited number of Yooper Ticket packages available from the Timber Rattlers Ticket Office, too. This package includes a box seat ticket and a specially designed Timber Rattlers baseball hat to commemorate the day for $25. Contact the Timber Rattlers ticket office to order a Yooper Day Ticket Package today. SUNDAY, APRIL 28 - GIRL SCOUT DAY: Discounted tickets are available for Girl Scout Troops on this date. All Girl Scouts attending the game may participate in a pregame parade on the field. Contact Group Sales Representative Kyle Fargen at kfargen@timberrattlers.com for information or to order tickets. FRIDAY, MAY 10 - DIGIORNO PRESENTS LOS CASCABELES NIGHT #1: The Timber Rattlers will change their name to Los Cascabeles and have special uniforms to mark the occasion. This is the first of three planned nights to celebrate Hispanic Heritage in the area. SATURDAY, MAY 11 - SUPERHERO DAY WITH ANT-MAN PRESENTED BY NORTH SHORE BANK: It's going to be a MARVEL-ous day at the ballpark for your little Avengers! Ant-Man is making his first appearance at Neuroscience Group Field. There is a Superhero Ticket Package that includes a ticket for a Box Seat, a Fast Pass to meet Ant-Man, an ice cream treat, and a guaranteed giveaway for only $25. MONDAY, MAY 13 - LOCAL HEROES NIGHT PRESENTED BY KWIK TRIP and FOX VALLEY ANIMAL REFERRAL CENTER: We salute area police officers, fire fighters, and first responders with a special ticket offer for them and an appearance by Paw Patrol for future heroes. TUESDAY, MAY 14 - FOX 11 WEATHER DAY: The FOX 11 Weather Team will be on hand for a pregame presentation and a meet & greet. Plus, fans will be able to try their hand with a green screen and check out the FOX 11 Storm Chaser Vehicle in front of the stadium for this game. Contact Group Sales Representative Contact Group Sales Representative Kyle Fargen at kfargen@timberrattlers.com for information or to order tickets. WEDNESDAY, MAY 15 - FOX VALLEY ANIMAL REFERRAL BARK IN THE PARK #2: The second of five Bark in the Park games during the 2019 season is happening on a Bang for Your Buck Night. The left field berm will be set aside for pets and pet parents to enjoy $2 beer, $1 hotdogs, $1 sodas, and a great baseball game. Admission for your pup is free! THURSDAY, MAY 23 - STEM DAY: It's an 11:05am start time and school children can come out to the stadium to learn about careers in Science, Technology, Engineering, and Mathematics from area presenters before and during the game. There will be interactive displays on the concourse and a pregame STEM/Baseball demonstration on the videoboard. THURSDAY, MAY 30 - FANG'S TOY NIGHT PRESENTED BY, CENTURY 21 ACE REALTY: The Rattlers aren't the only ones celebrating a 25th Anniversary this season. Woody, Buzz, and the whole Toy Story gang will mark their silver anniversary with us on this night. The first 1,000 fans to attend this game will receive a fun pair of Toy Story socks courtesy of Stacey Hennessey. FRIDAY, MAY 31 - BRATOBERFEST #1!!!! This was one of the most popular promotions cooked up in the first 24 years of the Timber Rattlers so the team is bringing it back for more than one night this season. The Rattlers will become the Wisconsin Brats again with some special jerseys that you will need to see to believe. There will be other trappings to celebrate German heritage in the area, including an appearance by The Jerry Schneider Band. SATURDAY, JUNE 1 - GREEN & GOLD CHARITY SOFTBALL GAME: Davante Adams and Blake Martinez are hosting the Green & Gold Softball Game at Neuroscience Group Field to raise money for charity. The game starts at 12:05pm and tickets are available now! SATURDAY, JUNE 1 - PRIDE NIGHT: We are holding our first-ever Pride Night at the ballpark and are still working on the details. Watch our website and social media accounts for the announcement. SUNDAY, JUNE 2 - FOX VALLEY ANIMAL REFERRAL BARK IN THE PARK #3: The third of five Bark in the Park games during the 2019 season is happening on this Sunday afternoon. The left field berm will be set aside for pets and pet parents to enjoy a sunny day at the ballpark. Admission for your pup is free! FRIDAY, JUNE 7 - POKÉMANIA: Remember when you had to catch 'em all? Now you can try to do that, meet Pikachu, and catch a Timber Rattlers game at the same time. The first 500 children (age 12 and under) will receive Pokéman promotional cards on their way into the game. Caleb Gedemer, the #4 ranked Pokéman player in the world, will be at the game to meet with fans. FRIDAY, JUNE 7 - SID THE SCIENCE KID APPEARANCE: The star of the PBS Kids' show Sid the Science Kid will be at this game to meet fans before and during the game on this night courtesy of AZCO, Inc.
SATURDAY, JUNE 8 - PRINCESS NIGHT #1 WITH PREGAME TEA PARTY PRESENTED BY NORTH SHORE BANK: The first of two fairytale nights at the ballpark begins with a Tea Party in the Fox Communities Credit Union Fox Club before the game. Your princess will get to meet some famous storybook princesses - Ariel, Cinderella, Merida, and Moana - and a Fairy Godmother. If you can't make it to the Tea Party, our guests won't be turning into pumpkins. They will be around during the game for photos with fans. SUNDAY, JUNE 9 & MONDAY, JUNE 10 - DANIEL TIGER APPEARNCE: Daniel Tiger returns to the stadium for two fun-filled days. Bring your little tiger to the park to meet him at either game. THURSDAY, JUNE 20 - SALUTE TO COWS: The Rattlers hold their annual Salute to Cows Night to celebrate America's Dairyland and National Dairy Month. We have some big plans this year and will be announcing more details as we get closer to the start of the season. THURSDAY, JUNE 20 & FRIDAY, JUNE 21 - PEANUT-FREE NIGHTS: There will be no peanuts or peanut products available at these games to allow our fans with peanut allergies to head out to the stadium. FRIDAY, JUNE 21 - WIZARDRY NIGHT PRESENTED BY NEUROSCIENCE GROUP: This promises to be a magical night at the stadium! FRIDAY, JUNE 21 - STRIKE OUT STROKE NIGHT PRESENTED BY NEUROSCIENCE GROUP: Neuroscience Group will have information and displays to raise awareness for brain health and the signs of stroke. SATURDAY, JUNE 22 - STAR WARS™ NIGHT PRESENTED BY STACEY HENNESSEY, CENTURY 21 ACE REALTY: You won't need to travel far, far away to celebrate Star WarsTM. The Timber Rattlers players and coaches will wear Star Wars™-themed jerseys for the game and fans could take home one of those jerseys if they win the online auction that will be held during the game. Stick around for a postgame fireworks display to music from the movies. Plus, characters from all of the movies made the journey to our ballpark to meet with all. TUESDAY, JULY 2 - FOX VALLEY ANIMAL REFERRAL BARK IN THE PARK #4: The fourth of five Bark in the Park games during the 2019 season is happening on this Tuesday night. The left field berm will be set aside for pets and pet parents to enjoy the pregame race and the baseball game. TUESDAY, JULY 2 - DIME DOG NIGHT: One hot dog for one dime for one night! We set a record of 7,267 hot dogs sold on our first Dime Dog Night in 2018. Can that number be surpassed this year? Can you come out and help us? TUESDAY, JULY 2 - PREGAME WIENER DOG RACE PRESENTED BY FOX COMMUNITIES CREDIT UNION AND HAPPILY EVER AFTER ANIMAL SANCTUARY: Start…your….dachshunds! Make sure to register your wiener dog for the pregame race with the ticket office. Last year's event was a hit and this year's race is going to take another step forward. SATURDAY, JULY 6 - MARGARITAVILLE NIGHT: The stadium becomes Margaritaville! The music and mood of a legend will be on full display on this evening! A package with food, a t-shirt, and a ticket to the game will be available. Contact Group Sales Representative Kyle Fargen at kfargen@timberrattlers.com for information or to order tickets. The Boat Drunks will perform all your favorite hits. They will be in front of the stadium before the game and on the first base concourse after the game. SUNDAY, JULY 7 - MILITARY APPRECIATION DAY PRESENTED BY SKIPPER BUD'S: The home team will wear special military-themed jerseys during this game when the Rattlers and American National Bank present Military Appreciation Day. There will be special ticket deals for active and retired military personnel for this game. WEDNESDAY, JULY 17 - RECORD BREAKING AIR GUITAR NIGHT PRESENTED BY FOX COMMUNITIES CREDIT UNION AND THE APPLETON HISTORY MUSEUM: Come out to the game on this night and help the Timber Rattlers as they attempt to set the Guinness Book of World Records mark for most simultaneous air guitar performances! THURSDAY, JULY 18 - DINOSAUR NIGHT PRESENTED BY 4imprint: Our history with Dinosaur Night doesn't go too far back, but it has grown with us over the last few seasons. The first 1,000 fans to attend this game will receive a Timber Rattlers safari hat courtesy of 4imprint. There will be a dinosaur, a baby triceratops or three, some dinosaur hatchlings, and the Jurassic Park Jeeps for you to see. You will have a chance to dig for fossils on the beach at the ballpark and we will have other Prehistoric surprises planned. FRIDAY, JULY 19 - SUPERHERO NIGHT #2: The second Superhero Night of 2019 does not have a guest to announce at this time. Who will be the Superhero to save us? You will have to make it to the Fox Cities on this night to catch the game and see who it is! FRIDAY, JULY 19 - CPR NIGHT AT THE BALLPARK WITH THE AMERICAN HEART ASSOCIATION: The Wisconsin Timber Rattlers and the American Heart Association invite you to attend this game and learn the life-saving skill of CPR. SATURDAY, JULY 20 - DIGIORNO PRESENTS CASCABELES NIGHT #2: The Timber Rattlers don their Los Cascabeles jerseys again for this game, their second of three planned nights to celebrate Hispanic Heritage in the area. SUNDAY, JULY 21 & MONDAY, JULY 22 - CURIOUS GEORGE: The curious, little simian has had so much fun at our ballpark in the past that he had to come back to see if everyone wanted to meet him again. George will be around for photos before and during both games. WEDNESDAY, JULY 31 - GIRLS NIGHT OUT PRESENTED BY AVENUE JEWELERS: Plenty of specials for the Ladies on a Bang for Your Buck Night at the ballpark. There will be a diamond dig in the beach presented by Avenue Jewelers, drink specials, and more. FRIDAY, AUGUST 2 - MINION NIGHT PRESENTED BY NORTH SHORE BANK: The henchmen are back for another delightfully evil night of baseball and you can meet them. SATURDAY, AUGUST 3 - PRINCESS NIGHT #2 w/ VIP TEA PARTY: If you have to miss the storybook princesses and the Tea Party in June, you have a second chance to see them at the stadium before and during this game in August with a whole new cast of characters. Come to meet Elsa and Anna, Jasmine, Rapunzel, and Snow White. This night also features a VIP Tea Party in the Fox Club before the game and photo opportunities during the game. MONDAY, AUGUST 5 - DIME DOG NIGHT #2: It is our second night at the stadium this season with hot dogs available for ten cents. It is going to be a big night. MONDAY, AUGUST 5 - FOX VALLEY ANIMAL REFERRAL CENTER BARK IN THE PARK #5: The final Bark in the Park of the season is your last chance to bring your pups to the park. SATURDAY, AUGUST 10 - FANG'S BIRTHDAY PRESENTED BY U.S. CELLULAR: Fang T. Rattler celebrates his 25th birthday this year. We are throwing a party for him on this night and you are invited. Area mascots will do battle in a kickball game before the Timber Rattlers take the field. SUNDAY, AUGUST 11 & MONDAY, AUGUST 12 - SUPER WHY: The lead character from the PBS Kids' show returns to meet with everyone. MONDAY, AUGUST 12 - KIDS ROCK THE BALLPARK: This is the final weekday day game on the schedule for 2019 and it kids can rock the ballpark one more time. There will be a pre-game performance by Appleton Rock School and a bike helmet giveaway from Neuroscience Group. WEDNESDAY, AUGUST 14 - FORTNITE NIGHT: It is time to celebrate the world-wide phenomenon. This is our first Fortnite Night and we will be giving away V-Bucks. Characters from the game will be walking around the ballpark for photo opportunities. Slurp Juice is on the menu with 9-ounce ($3) and 16-ounce ($5) sizes. We are still working on this one, fans. We will have more information as we get closer to this promotion. THURSDAY, AUGUST 15 - DIGIORNO PRESENTS CASCABELES NIGHT #3: The Timber Rattlers wear their Los Cascabeles jerseys on the final Hispanic Heritage Night of 2019. The jerseys will be up for grabs in an online auction in the area. FRIDAY, AUGUST 16 - SUPERHERO NIGHT WITH IRON MAN: The Invincible Iron Man returns to Neuroscience Group Field to meet everyone after drifting around outer space since the end of Infinity Gauntlet. There is a Superhero Ticket Package that includes a ticket for a Box Seat, a Fast Pass to meet a founding member of The Avengers, an ice cream treat, and a guaranteed giveaway for only $25. FRIDAY, AUGUST 16 - BOY SCOUT SLEEPOVER: Boy Scout Troops should reserve their tickets to the game and stick around afterwards to camp under the stars on the outfield of Neuroscience Group Field at Fox Cities Stadium. Contact Group Sales Representative Jared Jirschele at jaredj@timberrattlers.com for information or to order tickets. THURSDAY, AUGUST 22 - WISCONSIN NIGHT AND STRIKE OUT CANCER NIGHT: Our annual Strike Out Cancer promotion to benefit local families battling pediatric cancer. Timber Rattlers players and coaches will wear Wisconsin-themed jerseys that will be available in an online charity auction. FRIDAY, AUGUST 23 - ANGRY BIRDS APPEARANCE: Video game characters will come to life on this night and you can interact with some of your favorites. THURSDAY, AUGUST 29 - BRATOBERFEST #2!!!! The Wisconsin Brats and their jerseys are back for the second - and final - time this season. This is the night you will have an opportunity to win one of the game-worn jerseys in an online auction with the proceeds going to charity. The Jerry Schneider Band returns to the ballpark to perform for fans.